in center reverse: 1524 / .Mo.Go. Debruge-Duménil collection, Paris; (Debruge-Dumenil sale, Paris, 23 January-9 February and 4-12 March 1850, no. 1143). Prince Petr Soltykoff [c. 1801-1889], Paris; (his sale, Hôtel Drouot, Paris, 8 April-1 May 1861, no. 680). (Roussel, Paris). John Edward Taylor, London; (his estate sale, Christie, Manson & Woods, London, 1-4 and 9-10 July 1912, 3rd day, no. 250); (Duveen Brothers, Inc., London and New York); purchased November 1912 by Peter A.B. Widener, Lynnewood Hall, Elkins Park, Pennsylvania; inheritance from Estate of Peter A.B. Widener by gift through power of appointment of Joseph E. Widener, Elkins Park, Pennsylvania; gift 1942 to NGA. The Debruge-Duménil collection was formed by Louis-Fidel Debruge-Duménil, who died in 1838, leaving the collection to his son and a daughter who was married to Jules Labarte; the pottery was mostly sold in 1850; see Labarte, Jules, Description des objets d'art qui composent la collection Debruge Duménil precedé d'une introduction historique, Paris, 1847: 12. The provenance given in the Taylor sale catalogue is "Seillière, Debruges, Soltykoff," but this is probably incorrect; no Seillière sale before 1847 is recorded by Lugt 1938-1964, and the piece does not appear in the Baron Achille Seillière estate sale in Paris, 5-10 May 1890. 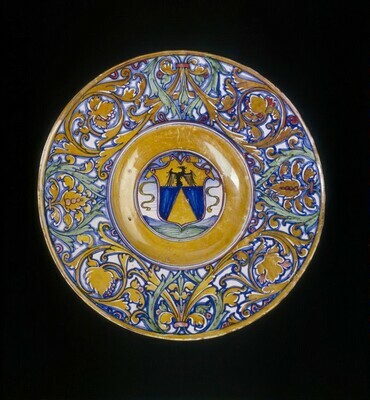 Sixteenth-Century Italian Maiolica; Selections from the Arthur M. Sackler Collection and the National Gallery of Art's Widener Collection, National Gallery of Art, Washington, D.C., 1982-1983, no. 31, repro. 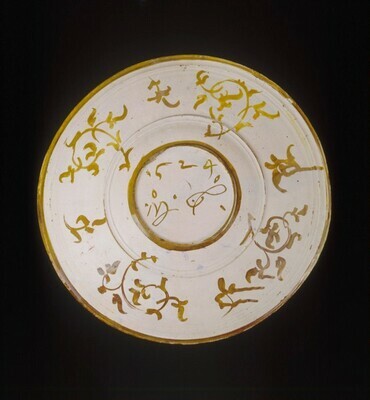 The plate, which has warped in the kiln, is of earthenware, covered front and back - except beneath the foot ring - with a slightly speckled whitish tin glaze. The reverse has several concentric ridges at the edge and where the rim meets the curving sides of the well. The painting is in blue, bright green, and black, with red and golden-yellow luster. There are three kiln-support marks and a hole caused by a defect in firing on the front on the curving sides of the well. There is slight wear, scratching, and chipping of the glaze, and a large chip in the foot ring. Labarte, Jules. Description des objets d'art qui composent la collection Debruge Duménil precedé d'une introduction historique. Paris, 1847: no. 1143. Inventory of the Objects d'Art at Lynnewood Hall, Elkins Park, Pennsylvania, The Estate of the Late P.A.B. Widener. Philadelphia, 1935: 59. Works of Art from the Widener Collection. Foreword by David Finley and John Walker. National Gallery of Art, Washington, 1942: 13, as Gubbio (Maestro Giorgio Andreoli). NGA 1982-1983, no. 31, repro. Wilson, Carolyn C. Renaissance Small Bronze Sculpture and Associated Decorative Arts at the National Gallery of Art. Washington, 1983: 119, no. 5. Distelberger, Rudolf, Alison Luchs, Philippe Verdier, and Timonthy H. Wilson. Western Decorative Arts, Part I: Medieval, Renaissance, and Historicizing Styles including Metalwork, Enamels, and Ceramics. The Collections of the National Gallery of Art Systematic Catalogue. Washington, D.C., 1993: 173-175, repro. 173.